August 06, 2017 CSE-PPT for Region 11 School & Room Assignment #CivilService - Exam News, Reviewer, Military Career, & Everything [MN] . . The Civil Service Commission (CSC) announces notice of school and room assignment for all qualified applicants of August 06, 2017 CSE-PPT for Region 11 examinees. In order find your name easier in the list below, download the file and press CTRL + F to search your name. 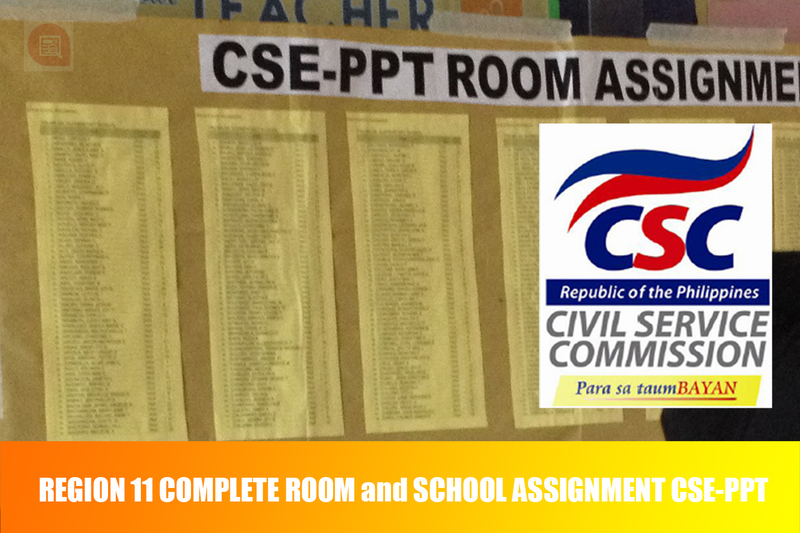 The CSC will conduct the CSE-PPT for Professional and SubProfessional levels in at least 54 test centers nationwide. If you're having difficulty in searching your name through the PDF file you may access the CSC Online Notice of School Assignment (ONSA) portal. ONSA is now available via the CSC website www.csc.gov.ph (enosa.csc.gov.ph/enosav3/). It can also be accessed through the path (webapp.csc.gov.ph/ExamAssign/ExamAssign.htm).